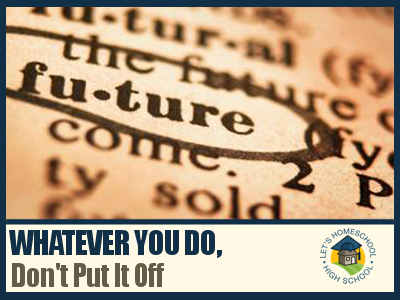 Whatever You Do…Don’t Put it Off! Getting ready for college isn’t an easy task for a high school student, but for the homeschooler it can be even more complicated. But, the good news is…Many prestigious colleges are now actively recruiting homeschooled students for their programs. Yet, it is still pretty tricky to get all the documents together that are required by some colleges. It takes a good bit of planning and preparation to make sure your high school student is ready and has what they need to make the application process go smoothly. It is highly advisable to begin preparing and planning when your student first enters high school. View all homeschool high school planning articles and resources. Colleges today are wanting students who stand out from the norm. If you can help guide your young adult to take courses and engage in studies that expand their strengths, you can help your student stand out from the crowd. But,again, this takes planning and is not something that you can put off until their senior year. Here is a summarized list of the requirements that most colleges will request from a homeschooler in order for them to apply. *Curriculum description should include all educational resources and texts used throughout the student’s secondary education. It should also include the concepts and educational objectives for each subject and course. It’s also a good idea to create a transcript for your child. There are several great examples here.